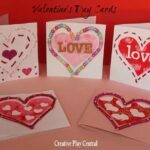 Welcome to Jaime from hands on : as we grow her wonderful Valentine’s Decoration come Valentines Gifts that Kids can Make depending on how you choose to use it. 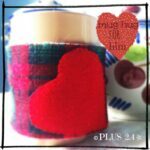 It is part of our 31 Days of Love series, which is slowly coming to an end (boo). Check out the Valentine’s Cards and Valentines Treats shared previously! 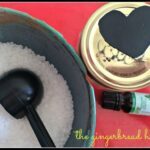 I’m thrilled to join in on Maggy’s 31 Days of Love this month! 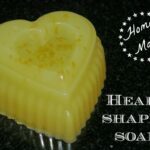 I’m Jamie of hands on : as we grow where I share kids activities for hands on moms. 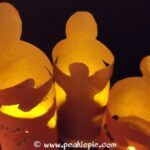 We do all sorts of activities, crafts, art projects and we love move and learn activities. All geared for toddlers, preschoolers and now kindergartners since my oldest, Henry is now halfway through! 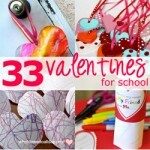 Last year I put together one of my favorite collections of crafts, 33 Super Cute Valentines for School. 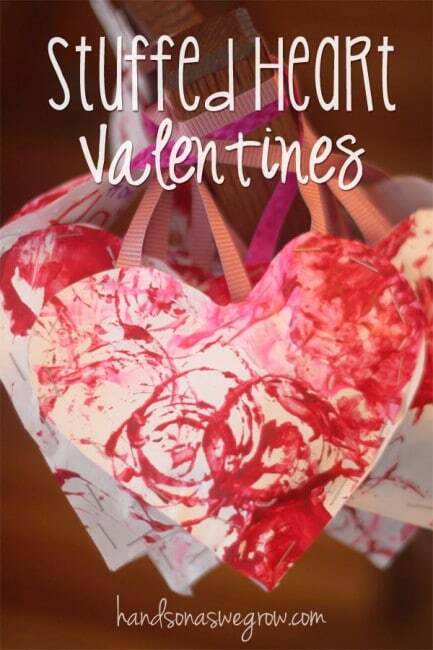 In that, I was inspired by Scrumdilly-do’s puffy heart valentines and made them a quick, goody bag version. 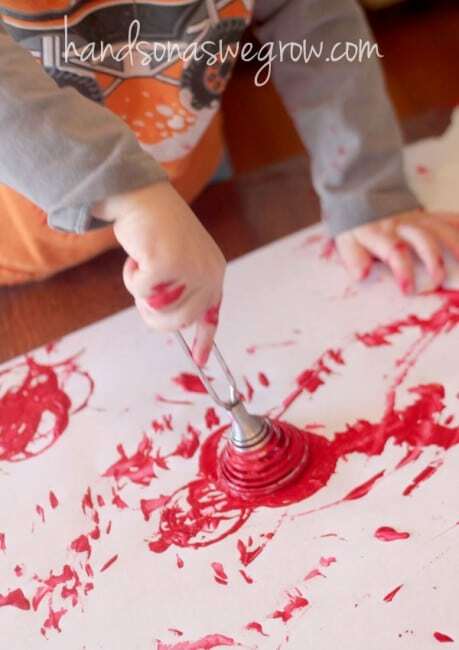 They boys started by painting large pieces of paper [we use butcher paper all the time for painting]. 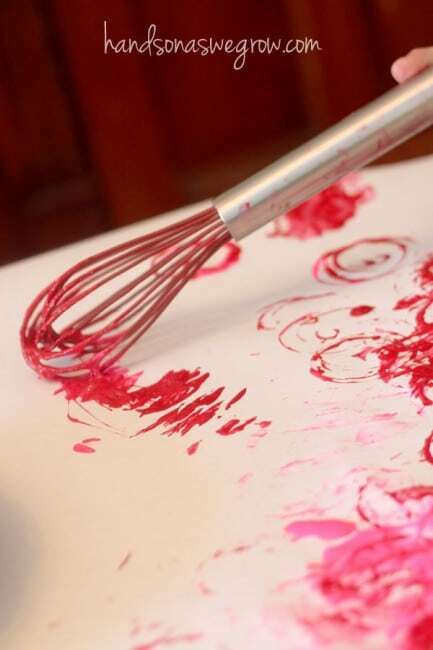 I set out red and pink shades of paint along with a couple kitchen utensils to see how they could paint using them. I set out a rubber whisk along with an egg beater. 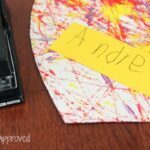 The boys covered their papers with paint and made all sorts of designs by rolling or bouncing the paint onto the paper. 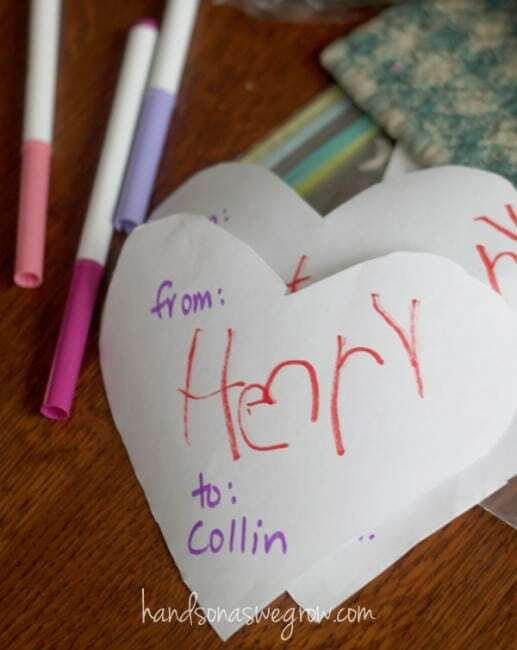 After letting the paper dry, my husband and I did most of the grunt work by tracing hearts onto the backside of the paper and cutting them out. Hand over the scissors to your kids if they’re up for the challenge though. Mine weren’t quite ready last year. 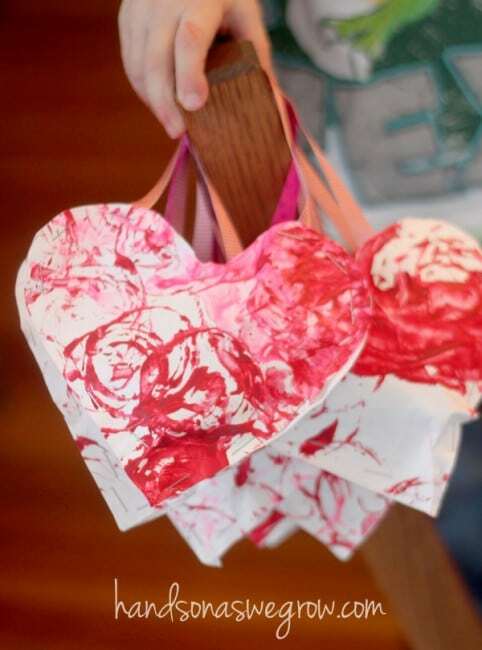 We cut half of the hearts from the artwork the kids made and half from plain paper. 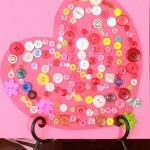 Next is to assemble the hearts to make a stuffed valentine! With two heart cutouts on top of each other, right sides out. I began stapling them together. I started at the bottom and went to the top of the curves on each side. Before finishing though, Henry would stick in the treats to give his friends at school. Then I stapled a ribbon to the top of each curve and finished closing the hearts. 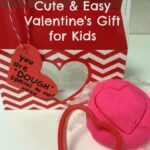 Stuff the hearts in a bag for your child to take to school to hand out as valentines, or give to Grandma! So sweet! Kitchen utensils? What a fun way to decorate! It was so much fun! They left some pretty neat designs. Thanks! What an adorable Valentine! I love how involved your four-year-old was in making each one and then stuffing them with a treat – so cute! Thanks Katie. He was determined to help – I think this year he could do more even. we actually created these this year! they were a hit with the children! 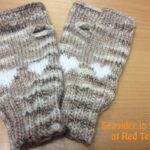 i actually found an adult type tutorial for sewn ones today as well. 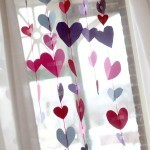 seems these puffy hearts are pretty popular AND pretty ;D great colors!